I’m Not a Racist…I’m a Democrat. For weeks the media have been covering "racism in health care reform opposition." For the most part I’ve found this political moment to be an interesting opportunity to discuss the meanings of race, the history of racial exclusion and violence, and the ongoing realities of racial inequality in America. But I have also been a little baffled as to why so many liberal white Americans are shocked about the sometimes explicit, but far more often, simply implied racial bias that has infected some of the opposition to the Obama administration. My scholarship and teaching center on issues of race, blackness, and African American politics, and while I believe "racism" is interesting and important; it is not exactly breaking news. Clarence Page of the Chicago Tribune laughingly suggested that he was telling his white liberal friends who were aghast at the vitriol aimed at President Obama, "welcome to my world." "I don’t believe that all the people who oppose him [Obama] on health care — and all the conservatives — are racists. And I believe if he were white, every single person who opposes him now would be opposing him then." I agree with Clinton that the opposition to President Obama’s plan is about health care reform, not about race. Any Democratic president who introduced health care reform was going to be met with vicious, organized opposition. No one knows this better than the Clintons whose own health care reform efforts were effectively shut down by organized efforts on the Right. The opposition is about policy and profits, but the frames, the tone, and the strategies of that opposition are always unique to the opponent. When the Clintons introduced health care reform they were not called Witch Doctors or monkeys. Racialized language and images are used to help frame arguments against Obama in particular. "While I have devoted my life to getting rid of racism, I think this [health care] is a fight that my president and our party — this is one we need to win on the merits." This statement required a double take. President Clinton said that he has devoted his life to getting rid of racism? And no one challenged this assertion? President Clinton has a very checkered past involving racial innuendo, stereotypes, and racialized political strategies. When he first ran for President in 1992 Bill Clinton attacked hip-hop artist Sister Souljah during his speech to Jesse Jackson’s Rainbow Coalition. He likened her to former Klansman David Duke. After the 1984 and 1988 defeats of Democratic candidates, Clinton knew he needed to signal his independence from Jesse Jackson and the racially progressive wing of the Democratic Party. His unprovoked attack on Souljah was part of that active distancing. But, Clinton’s strategy was complex. 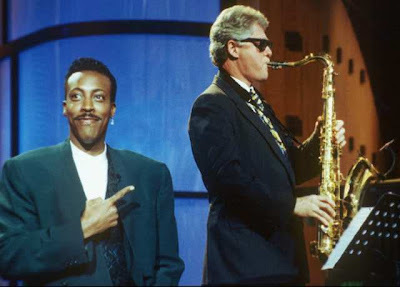 During that same election, he also appeared on the Arsenio Hall show where he played the Saxophone. Clinton has always been masterful at both embracing and pushing away from black communities, black voters, and black interests based on his own political needs at the moment. Some have accused President Obama of using similar tactics. Clinton used welfare reform and crime legislation to cement his position as a moderate "new" Democrat. Clinton’s policies made life substantially more difficult for poor black mothers and led to the incarceration of tens of thousands more black men. Repeatedly during his presidency Clinton found his way to the center by ignoring the material needs of black communities. He refused to fight for his nominee and law school friend Lani Guinier who was viciously and inaccurately labeled a "quota queen." And when his wife was battling Barack Obama for the Democratic nomination last year, President Clinton’s own voice sounded shrill in precisely the same ways as some of Obama’s current opponents. Despite his office in Harlem and his efforts in Africa, I am unconvinced by President Clinton’s assertion of a lifetime commitment to battling racism. I recognize that this is where the public conversation falls apart. I am not claiming that President Clinton is a racist who harbors negative racial animus toward black people. I suspect the opposite is true. Clinton has an amazing cultural ease and familiarity with black people. It is one of the reasons he was so wildly popular among black voters despite his often troubling policies. I’ve seen President Clinton sing, from memory, all the verses to James Weldon Johnson’s Lift Every Voice and Sing. I bet that fewer than 50% of the Congressional Black Caucus knows this unofficial black national anthem by heart. But President Clinton’s cultural ease, personal familiarity, and even physical proximity to blackness and black people is not the point, his willingness to deploy racial strategies for political purposes and to create policies with a disparate racial impact is the point. Somehow our public discourse on racism has devolved to a kind of investigative search of the human heart. We want to figure out if the Tea Party protesters are racist by making guesses about how they feel about black people. In truth, I don’t really care how they feel. Maybe they hate Obama because he is black, or because he is a Democrat, or just because they think he dresses oddly. Who cares? The point is that some members of the GOP, the health care industry, and some people in the crowds are using strategies, language, and images that are meant to stoke racial fear and anxiety. Many have principled opposition to the reforms being proposed by the administration, but that opposition is swimming in a sea of racial ugliness. But when I heard President Clinton’s revision of his own political racial history it struck me that the biggest issue may not be uncovering racism on the Right, it may be that we are providing cover for racism on the Left. If opposing Obama means you are a racist, then supporting Obama must mean you are not a racist. No need to worry with substantive efforts to compensate historic injustices or address contemporary inequalities, just keep wearing your Obama ’08 shirt and you can have a free pass on racial politics. Racism is not the the sole domain of Republicans, Conservatives or Southerners. Not all racists pepper their conversation with the N-word or secretly desire the extermination of black and brown people. Racism is complex, multi-layered, and deeply rooted in the American story. Name calling is not helpful in uprooting racism, but neither is a false sense of moral superiority.